Well, it’s official. 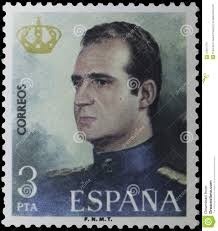 The monarch who shot a caged elephant will step down and el Principe de Asturias will become King Felipe VI although your Blog Hostess cannot find an official date for the handover. Naturally, we all wonder what kind of Queen Consort Leticia will be. Personally, I find the ex-news reporter duller than a butter knife, an inspiration to anorexics and in a personality contest, the butter knife would win. She’s always scowling. I don’t think she’ll be as fabulous as Maxima or the future Queen Victoria of Sweden. What do you think? Queen Leticia something to look forward to? Who is your favorite of this generation of crown princes? 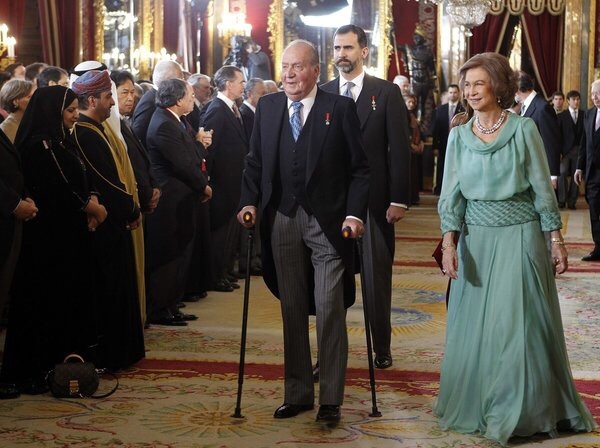 This entry was posted in court and social, other glittery events, spain and tagged king juan carlos, news, royalty. Bookmark the permalink. well, she is having to put up with the Bourbon nose. funny! I never noticed their noses before…maybe because they don’t have a lot of profile portraits taken. Everyone in France always complained about Marie Antoinette’s ‘Austrian” nose and her Hapsburg lip. I wonder how those two noses would compare. And shouldn’t the lip trait turn up too? I know it’s a dominant one. Hmmm…I did a post on that ages ago. Let me see if I can find it. Thank you for the comment and I’m so sorry it took so long to reply. Hmm. Which designers does Mary prefer? I also dig Grand Duchess Stéphanie de Lannoy’s style, even casual she keeps it cute & feminine. You know, we don’t do as much about the Danish royal family as we should. Maybe we should have a Denmark Tiara Theme Week. We’d all get an eyeful of Crown Princess Mary’s style then! Thank you for inspiring a great idea! I’m not generally a fan of CP Mary’s style but when she’s in a tiara and gown, I love it! I like Stéphanie’s style, especially whenever she wears Elie Saab! You should do a Danish Tiara Theme Week! The DRF is probably my favourite, after the BRF. Hahahaha! If it’s shallow then this is the shallowest blog ever! Tiaras on Display may as well be the name! Unfortunately, there weren’t any! There’s a coronation crown but it’s only symbolic, not even made to be worn on a head. It just sat there on a table in congress while Felipe was sworn in! Boring! Do accept our apologies for the late, late reply! We were in Madrid for the past month! Madrid, how lovely! I actually wore a tiara in Madrid once. Slightly disappointed with the lack of tiaras on this occasion, shame. Crowns are nice but wasted on a table. A Tiara Worn in Madrid. There must be a fabulous backstory to that potential movie title. well obviously I like them, and best wishes. it will be after the Cortes officially approved the new king which should be June 18.
thanks for your comment! the Telediario convered every second of the “abdication vote,” even though everyone knew it was going to pass. 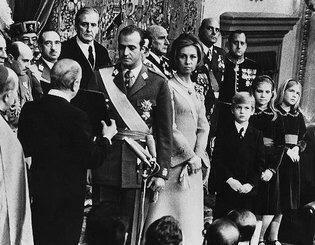 Juan Carlos I has to be the only Spanish king to ever abdicate…or was he just the first one to abdicate under a constitution? wow. did you just recall that off the top of your head or did you look it up? i knew it from school days ::)I am Spanish Citizen too! exactly good memory. So we are Madridistas ::) i am still link to the club with honorary membership in five peñas or supporting groups there. Maybe one day meet in Madrid for a game lol! I’d love some blogs on that! 🙂 ! Letizia looks quite handsome in casual slacks and in business suits. But then again we’re talking Queen Consort in the same breath as slacks and business suits. For that, I think she will do poorly. Maxima. The name of all names. Hi Aubrey! Thanks for your comment and do accept our apologies for the tardiness of the reply. We’ve been in Spain since June 2 and tend to ignore technology for long, leisurely strolls through Madrid. To top that off, she never, ever smiles. She’s like a human audit. we didn’t even get a Tiara D: But I hear that the Spanish Economy is in dire straits and completely support the Monarchy if they were being thrifty by not burdening the people with a big coronation. Dear Lady Apfel, I wrote this reply so long it could have been a post and I sign in today and it never posted! Please accept my apologies! No tiaras, true. It was a very informal event, an AM reception after Felipe took the oath in congress. No other royal families were invited. [Though Pau Gasol was…hmmm.] The minimalist celebration was nowhere near a tiara-event, but the lack of headgear may be chalked up to Leticia herself. Supposedly she likes simplicity and tends to avoid baubles. Boo! Yet another reason why she’s not my favorite Queen. As far as the economy and the public’s opinion of the Spanish Bourbons, it’s quite poor. [Yes, both economy and public approval.] To go into detail, I think we’ll just do a post instead. If I go into it here, you’ll be reading ’til next Tuesday! Thank you for commenting and your patience!